Click on image to view the complete map. Often times my thoughts turn to other cities. This fantasy map for rail-based transit in San Francisco is the culmination of some of those thoughts. The premise behind this map is that the Transbay Terminal need not be the San Francisco terminal station for the upcoming California high-speed rail system and that the existing 4th & King station site, with some modifications, is more than adequate to serve the task. The only service that truly needs to directly serve downtown is Caltrain, details of which are described in its section below. The 4th & King station has been renamed Mission Bay Station to acknowledge it’s increased prominence as a transportation hub. Yes, I am aware that terminating high-speed rail at Mission Bay Station is illegal according to Proposition 1A and that construction and engineering on the new Transbay Center is likely too far along to change course, but let’s not let that get in the way of a little hypothetical fun. On with the proposals (BRT and infill stations not included). High-speed rail follows the Caltrain right-of-way to Mission Bay Station where it would terminate underground on the King St side of the station. This would allow for future development above the station and a later extension of the high-speed rail line underneath King St into a new transbay tube to Oakland and beyond. Caltrain currently terminates at 4th & King over a mile from the heart of downtown San Francisco. A 1.3 mile tunnel currently in the works will extend Caltrain (and future high-speed rail service) from 4th & King to the new Transbay Center and should be a boon to thousands of Peninsula commuters. However, I don’t think the project is ambitious enough: with a little rerouting, Caltrain could be extended to the Presidio and possibly into Marin County. From Mission Bay Station, née 4th & King, the Caltrain line extends east underneath Townsend St. The line then curves underneath Essex St (or First St) to a station perpendicular to the Transbay Center with connecting passageways to the Market St tunnel for passengers transferring to BART or MUNI. Proceeding northwards across Market St, the line follows Samsome St (or Battery St) with a station serving the northern end of the financial district at Washington St. Curving underneath Telegraph Hill to Lombard St, the line continues westward with stations at Columbus Ave, Van Ness, and Fillmore before terminating in the Presidio. The Presidio terminus would be designed to allow for a future northward extension across the Golden Gate into Marin County where it could conceivably link up with SMART. Dreams of a second transbay tube have been envisioned since before the first one was completed. Likewise, the need for rapid transit along Geary Blvd, of any kind, has long been apparent. From Oakland, a new BART line shares a new transbay tube with high-speed rail. Just before reaching San Francisco, BART separates from the high-speed rail line to follow underneath Brannon St given that King St and Townsend St already have tunnels for high-speed rail and Caltrain, respectively. The first San Francisco stop at 2nd St would serve the ballpark area; the next stop, 4th St, would serve Mission Bay Station via a connecting passageway. Turning north on 7th St, a station at Folsom St is quickly followed by an interchange with the Market St tunnel at Civic Center. From there, the line finds its way to Geary Blvd with stations at Van Ness, Fillmore, Masonic, Arguello, and Park Presidio. The line then curves southwards via 19th Ave with stops at Judah, Taraval, and Holloway before merging with the existing BART line at Daly City. Okay, I’ll admit it. 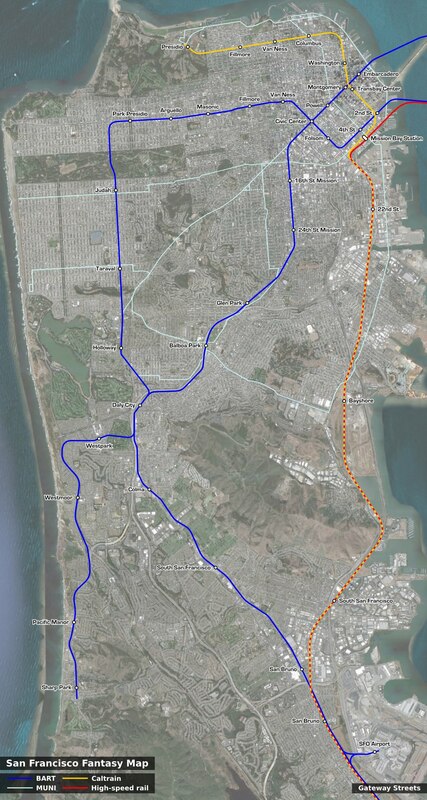 Adding a new branch line from Daly City to Pacifica is pure fantasy. But with so many trains converging on Daly City and forced to terminate, why not create a new line to serve an underserved market? The Daly City station would get a 4th track to allow cross platform transfers between the two trunk lines. From Daly City, the Pacifica line quickly turns west underneath Lake Merced Golf Club and Southgate Ave to a station serving Westlake Shopping Center. The line then curves underneath Skyline Blvd climbing up to a station at Westmoor Ave. Continuing south into Pacifica, the line then surfaces in the median of CA-1 with the final two stations serving the Pacific Manor and Sharp Park neighborhoods. The Central Subway’s illogical stub-end in Chinatown is extended to Fisherman’s Wharf via Columbus Ave. A Lombard St station would intersect with the underground Caltrain line proposed above. As already studied, the historic streetcar F-line would extend from Fisherman’s Wharf to the Presidio via the Fort Mason tunnel and Marina Blvd. Within the Presidio, I’ve shown the P-4 option from the 2004 feasibility study which would take the streetcar on a one-way loop via Mason, Halleck, Lincoln, and Girard. A station at the intersection of Lincoln and Girard would serve the Caltrain terminus station proposed above. Going west from the E-Embarcadero on King St, streetcars would turn right on a 4th or 5th St and then left on Townsend St. Streetcars would then proceed along Division, 13th, and Duboce to reach Market St. At Market St, I can’t decide whether the line should be on the the surface, underground, or both to maximize operational flexibility. The T-Third is extended west from its southern terminus to Balboa Park via Geneva Ave forming yet another large loop in the MUNI streetcar system. Credit goes to Transbay Blog from which many of the ideas and inspiration for this fantasy map of mine came. That is a good map of BART. Can you do that for St. Louis? I can and will. Posts for St. Louis will begin next month.